Is It Okay to Walk and Run? It's absolutely fine to walk during your long training runs and during the half marathon (or any race) itself. Some runners mistakenly associate walking during a race or run with giving up and will only walk reluctantly when they reach the point of extreme fatigue or discomfort. We encourage runners to embrace walking as part of their overall strategy for completing long runs or races, or as a cross-training activity for non-running days in their training schedule. Walking helps you increase your muscle endurance without putting as much stress on your joints and muscles as running does. Your heart rate is lower when you're walking, which means your body will use fat for energy rather than mostly fast-burning carbs. As a result, you won't run out of energy as quickly. Walking during a long run or race gives your running muscles and joints a chance to rest and recover, which can help you complete your planned distance and also help prevent injuries. Taking a walking break can really break up the monotony during a long run or race, which can help you deal with the mental challenges and any discomfort you may be feeling. Walk for the warm-up and cool down portions of your runs. Try a run/walk approach, where you run for a certain period of time or distance, and then walk for a different interval. Some runners who use this approach say it helps keep them injury-free and allows them to go longer distances then if they were just running. Walk through the water stops during a race. Some runners like to break up their running by walking through water stops so they don't have to try to drink on the run. 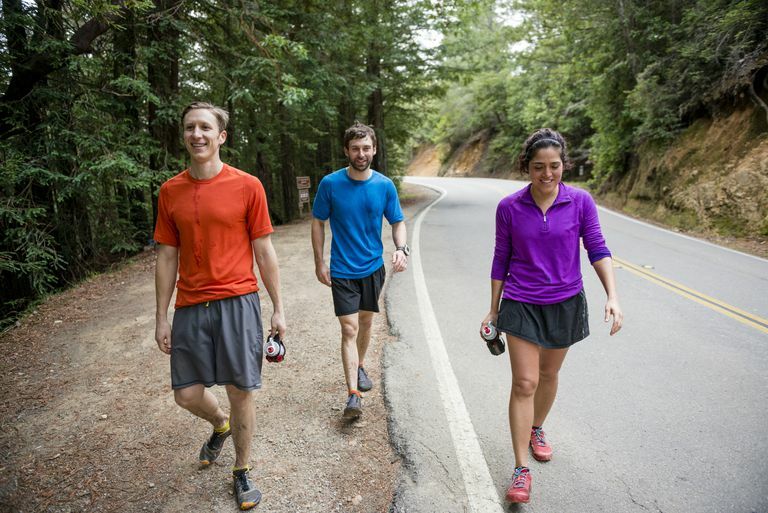 Walk the uphills when you're doing a hilly course, either outdoors or on the treadmill. If you do incorporate walking into your runs, just make sure that you still maintain good form and don't take it as an opportunity to really slow down and rest. You should keep your elbows at a 90-degree angle (not at your side) and take quick steps. That will make the transition back to running much easier. Also, don't wait until you're exhausted and sore to take a walk break—it's much harder to start running again if you walk when you can't run anymore.